Ding and Dang, also known as First and Second canyons, are the next two breaks through the San Rafael Reef west of Bell and Little Wild Horse canyons, and are reached by the same maintained access road, starting from Goblin Valley State Park. Both are short - the interesting parts are less than a mile long - but quite exciting and although only a few hundred yards apart are somewhat different in character; First is the narrowest, and has the prettiest passages, while Second is more testing since it contains a few troublesome pools and chokestones. The round trip (4.5 to 6 miles depending on the route) takes from 2.5 hours. The trailhead is along the same unpaved track that passes close to Bell and Little Wild Horse canyons - a side road heading west, starting just before the entrance to Goblin Valley State Park. After the parking area for these first two canyons, the track continues west, beside or along a stony creek bed, but is still fine for any vehicle since it is regularly maintained by the BLM. The starting point for the Ding/Dang hike is just 1.3 miles more, where the track turns due south as another wash joins from the west, and several cottonwood trees provide shaded parking places. There are various good places suitable for primitive camping along this road. 10 views of Ding and Dang Canyons. TopoQuest topographic map of Ding and Dang Canyons; Ding is west of 5006T, Dang is east of 5172T. The loop hike through the two canyons is normally done in the anti-clockwise direction since the obstructions in Dang Canyon are easiest to pass when walking downstream. 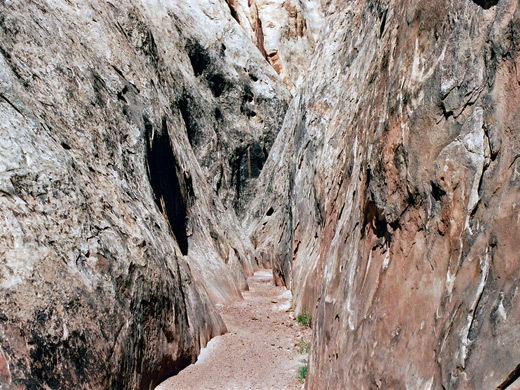 So, to enter the lower end of Ding Canyon, walk up the wash for about 20 minutes (one mile), around two wide bends to a junction, just in front of a crumbling cliff face made of twisty grey-green strata, and beneath a big cedar tree. The streamway of the right fork (Ding) is smaller than the main wash (Dang) and may be easy to miss. 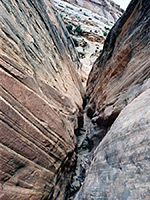 Hiking up here, the creekbed follows a sharp U bend then heads directly towards the reef, initially through some angular strata then into the smoother, pale red Navajo sandstone layer, where the narrows begin. The passages are V-shaped, running between high, curving walls without any overhangs or enclosed places but nice enough. 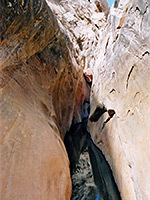 They contain a few small chokestones but don't extend too far as the Navajo is replaced by the overlying Kayenta Formation, as the drainage gains height more quickly via a series of sculptured potholes and dryfalls (all easily passed on one or both sides), and eventually opens out. The canyon walls now are composed of a great assortment of decaying rocks, of many different colors and forms. The cliffs eventually fall away, at which point the next canyon (Dang) can be reached by walking west on flattish land for half a mile, along an old mining trail a little of the way, or, rather sooner, by climbing up and over the rocky ridge that separates the two drainages, starting just north of the section with potholes. 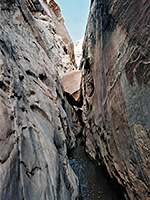 The upper part of Dang Canyon also has a few potholes, and a dryfall of sorts that has a rope attached to aid climbing down, but this is quite easily avoided by walking along narrow ledges to the right, then soon after is blocked by a large chokestone, also passed on the right. Below here is the best, narrowest section which includes 4 or 5 boulders wedged above pools, creating drops of up to 3 meters. The highest obstruction may need a rope to overcome though it is not too difficult to chimney down. 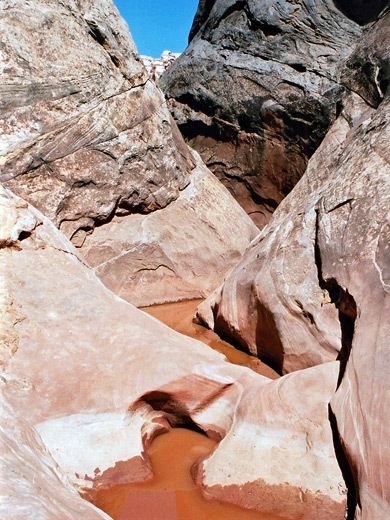 After wet weather there will be two longish pools 2 to 3 feet deep, just before the ravine ends, and if the rains are heavy, the canyon system might be impassable for a day or two. 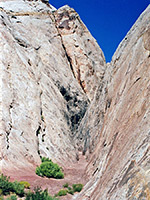 From the mouth of the narrows it is less than a mile down the wash back to the confluence with Ding Canyon.